Are you up for Australia’s toughest food challenge? Pride yourself on finishing everyone else’s meal? Realise that the meal isn’t finished when you’re full – it’s when you hate yourself? Read ‘serves 4’ as ALL FOR ME?! Buddy, we get it. You’ve got an appetite for scales destruction, and we’re all about it. Airtasker and Menulog agree, and they’ve joined forces to create the Ultimate Food Task Challenge. Think you’ve got what it takes to be the very best, like no one ever was? Check out what you could be putting yourself, and your waistline, through. You gotta eat ‘em all. With 30 minutes on the clock, you’re going to be taking a slice out of your lifespan – but if you can devour a 36 slice, 60cm pizza within that time, it’s totally worth it. Only 10 have come before you, could you be the newest champion?? 5 burger patties, 5 slices of cheese, 5 slices of bacon, 3 buns AND a whole lot of fries. You’ll be 5 times more likely to have a heart attack, but think of the glory when you earn your place on the Misty’s Diner wall of fame! In the red corner, weighing in at over 1kg (hello big boy! 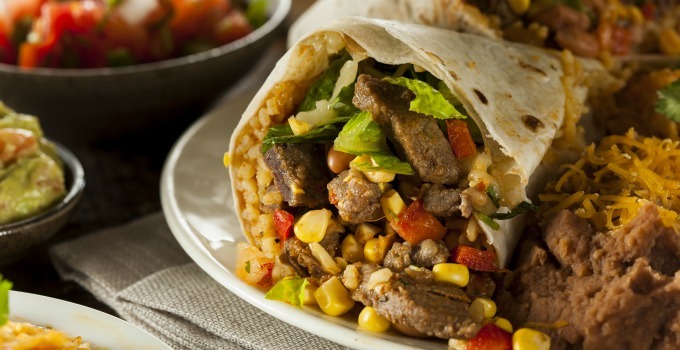 ), is the Jumbo Burrito at Cantina Mexican in Surry Hills, and in the blue corner – you. Conqueror of burrito, salsa queen of Sydney and nacho lord of NSW. This is not a challenge to be taken lightly (literally), but variety is the spice of life, right? Better add some jalapenos. We schnit you not, Radelaide has a challenge you can’t chicken out of. Should you choose to enter the thunderdome you’ll do battle with a 1kg schnitzel, complete with a side of chips and a litre of cold beer. The end is in sight, and if your body hasn’t completely broken down, or become riddled with scurvy, there’s just one more challenge before you. Head west and prepare for one of the hottest experiences of your life, the ‘too hot to handle’ spicy curry from Thailicious. You might want to stock up on Imodium at this point. Airtasker and Menulog will fly you around the country on them (legends), and even present you with $1000 at the end. It’ll no doubt go on PT and Jenny Craig, but glory is glory. Do us proud and enter today! To find out more about the challenge and to apply head here: Words by Emma Callaghan & Laura Potter – the gourmands who consider 36 slices an entrée.